A senior citizen who thinks she is always '25' can come up with lots of idea when preparing breakfast for herself or her loved ones :p and this Momsie creature is one creative and a romantic retard person !. 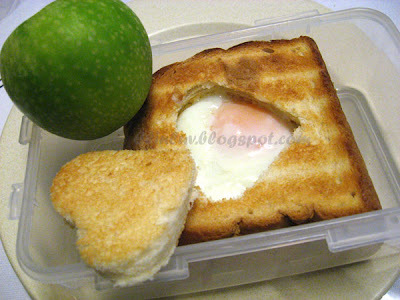 I love eating toast bread with half boiled egg or poached eggs....with dashes of pepper and light soy sauce. I had a good sleep last night thus I woke up feeling very refreshed and very creative. I had to let my mind run loose at times and allow it to take control and I came up with this half boiled egg in the heart shaped dent of my toast. My colleagues all laughed heartily at my breakfast for they find it funny ....LOL! 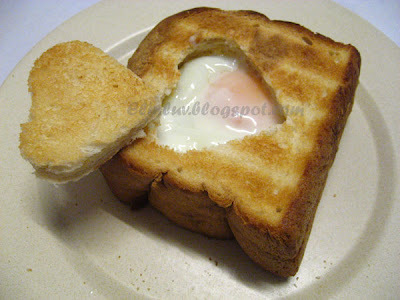 I think it is cute and fun to have my toast and egg presented in such a hearty way ! Christmas is a time of sharing and loving.....so if you like to be little creative in presenting food to your loved ones...this is one way to show your love :p It is so COOL ! 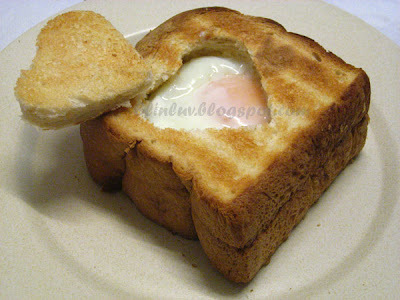 It is one very simple and cute way of presenting toast and egg....simply toast 2 slices of English Bread in the oven @ 180 C for 10 -15 minutes ( depends how well toasted and brown you want it to be ) take it out and use a medium size heart shaped cookie cutter, cut out the heart on one slice of the toasted bread. 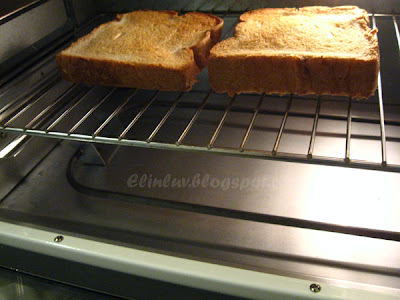 After which, spread a thin layer of Bovril or butter on the uncut toasted slice while it is still hot . Lay the slice with heart sharp cut out on top of the slice with Bovril spread. Gently break open the half boiled egg and gently place on the heart shaped dent and give a few shakes of pepper and a dash of light soy sauce on the egg. 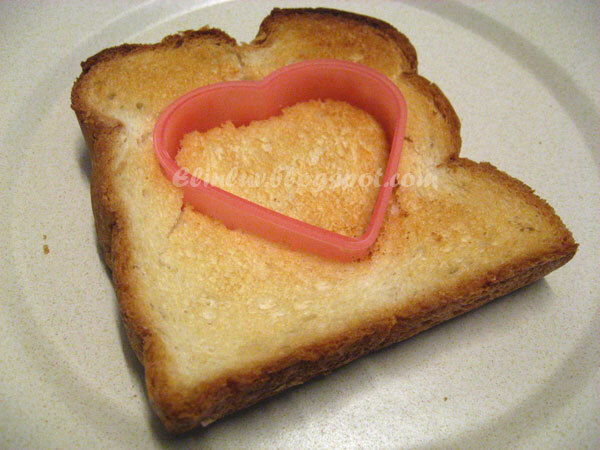 Cover back with the heart shaped toast and served hot. 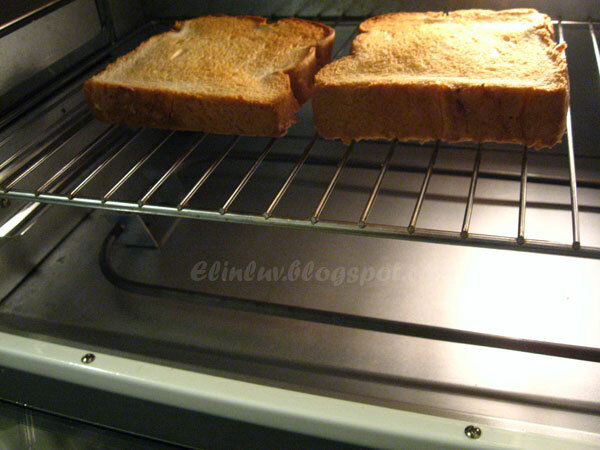 It is best taken while it is still hot... and enjoy the crispness of the toasted bread...mmmm yummilicious and I am sure your loved ones will enjoy this toast prepared with so much love :) COOL and yet full of warm ! Ohh how sweet! You are one loving momise Elin, heehee! I've done egg in toast before but I cracked the raw egg into the bread and toast/bake together. You may view my pics here. Thanks for sharing this great idea as I tend to have undercooked eggs when I did it my way. And when I cook it further, the bread gets slightly charred. Wow so romantic and really you do have fantastic ideas, momsie!! 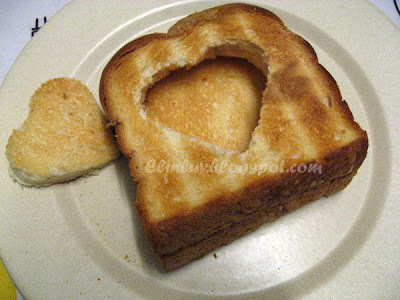 Thanks for this Love Toast, you are so sweet, hehehe! You made the simple toast looks so lovely! Good job! Ooops! I forgot to say thank you very much for the Stylish Award. I love it! Elin, this is SO cute! I don't really eat eggs like that due to the health reasons, BUT I think this would be just as adorable with peanut butter and jelly. I am going to have to surprise my husband with that soon. Really fun way to have your breakfast. So cute. Wah...so romantic. LOL!!! Miang keladi, makin tua makin jadi... Muahahahahaha!!! P.S. We stopped by Ipoh on the way up Cameron. Had breakfast in some area around Jayajusco. Mandy says your house somewhere around there. i can imagine waking up in the morning and see this up on the breakfast table..ooh, that would be so sweet! Sonia....hehehe...even my colleague teased me about it when they saw me eating it...so cute nya and so sweet nya :p They thought my wild boar did it for me LOL! 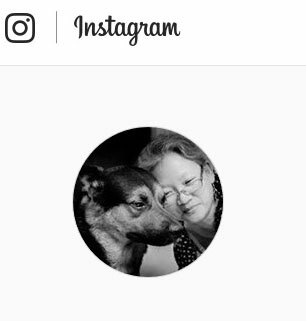 Lena....waiting for your 'tau fu Fah' post....I can't wait to see yours !!! elin, just posted the tau foo fah and linked it back to yours. thanks so much!! Lena....glad that you tried out my recipe for the soymilk custard...I told you that you will love it better than funny mountain :p and I was right :p You have done a great job on it :) silky smooth ! 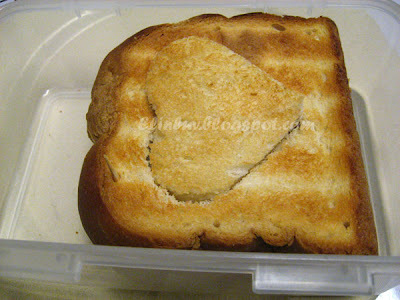 So, this is momsie's toast for the day! Looks very much like those selling at Old Town Shop! hehe.... Have fun! Awwww! I LOVE this! That is the sweeeetest thing. I love eggs too, though I definitely have it more than twice a fortnight haha. This is a very pretty toast and a very clever idea! I can surprise anyone with this nice breakfast. Should definitely make their list! This looks really delicious! Although I couldn't make and take to work - I'd have to eat it straight away! 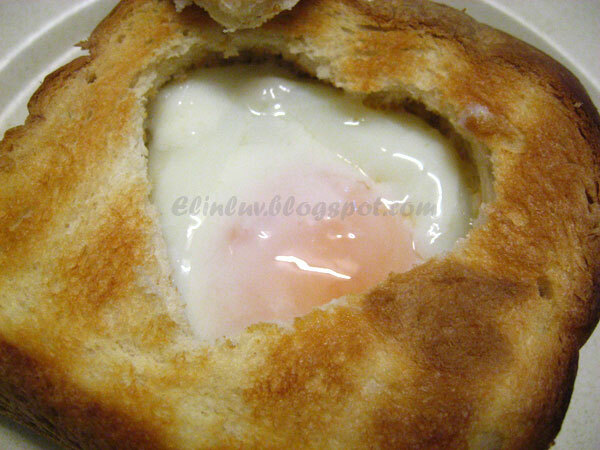 Only made this by frying bread in a pan with egg cracked in it. I have a daisy cutter so the white egg petals and yellow yolk centre look cute! Why only 1 egg a week? Yolk is good cholesterol no?